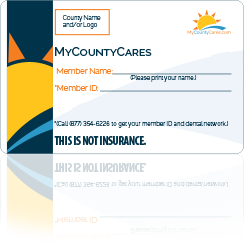 Help your county residents stay healthy with a MyCountyCares savings plan. We offer three savings plans that each keep your residents happy and healthy at an affordable rate. The Dental Plan offers the largest discount dental network available and residents can save big on most dental procedures including routine exams, cleanings and more! Our dental fee schedules offer price transparency and real discounts. The Free RX Card offers residents a state-of-the-art prescription discount program to help them save on name-brand and generic prescription medicine. The One Card offers residents a wide range of products and services including vision care, LASIK, hearing care, imaging, diabetic care supplies and more! Fill out the form below to receive information about our products by email.